Students at Rosemont are interested and involved. Elected student representatives on the student council take their positions seriously, knowing that they will be accountable to their peers throughout their term. They also take on roles of real responsibility as prefects in lower year classes and serve as excellent role models to younger students. Recently at Rosemont School, the new Head Girl, Deputy Head Girl and Prefects were elected to the school’s Student Council. We were first informed of the elections in January, when our class prefect and teachers told us we would need to begin preparing for interviews and speeches in late January. We were told that the process involved a short interview with the Principal, Deputy Principal and Student Council Liaison Teacher, and then we would present speeches to the entire group of teachers and classmates from 5th and 6th year. At first, the interviews seemed quite nerve wracking, and I was worried to how it would turn out, however once I was in the presence of the teachers and replying fluently to the questions, I became less nervous and more comfortable with answering and giving my output and opinion to the subject asked. The interviews allowed us to show our natural personalities and viewpoints on the topics spoken about. 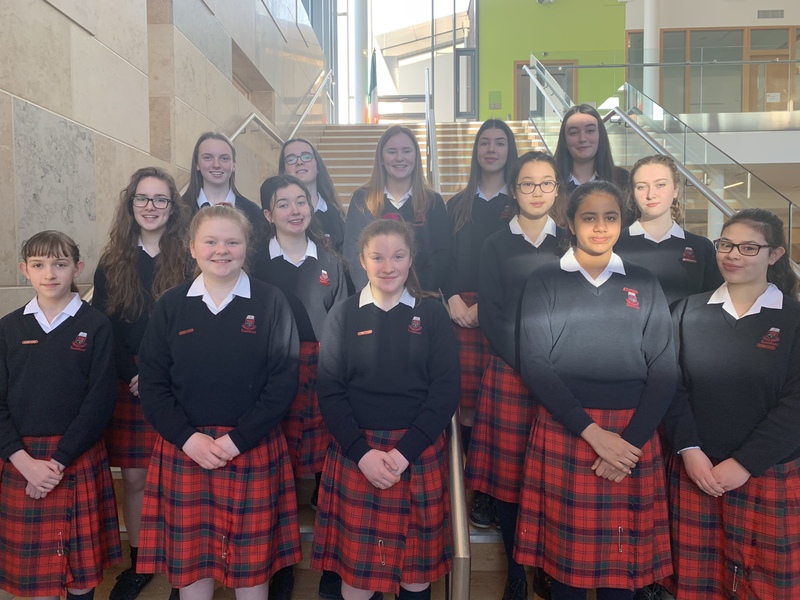 Back row: Ruth F, Megan D, Grace M, Alexandra P, Tara H.
Middle Row: Sara R, Caoimhe O’D, Linxi G, Isabel F.
Front row: Ella O’L, Abigail S, Jean C, Siddhi S, Siobhan B. We then wrote and practiced speeches in advance, and once we had typed our speeches we presented them to a few teachers, and received feedback in order to improve and make changes to our speech for the next day, when we would be speaking to the rest of the staff and senior pupils. I think the speeches are what most people were anxious about, as it was a chance to make a good impression on the people voting for us, and so once everyone had prepared and perfected their speeches, they were shown to the teachers and pupils, and everyone did such an amazing job in giving their viewpoints and were all so confident when giving them. Once you stand in front of a group of people it can be quite daunting, however when you’re confident in what you’ve written, and speak as yourself, the nerves disappear quickly. Everyone was congratulated on their well written speeches. The vote took place and votes were counted. The results were announced to the school in assembly and the new Head Girl, Deputy Head Girl and Prefects were presented with their badges. We have since had our first Student Council meeting and have lots of hard work and exciting plans ahead of us.